Nageshwar (नागेश्वर) and Vasota (वासोटा) - Well, the need for trekking in the forest, visiting an old fort, an hour of a ferry ride and a strenuous climb, all are satisfied here. But all you need to do this is a permission from Koyna Wildlife Reserve (forest department). Yeah, thats because this whole thing spreads along the backwatrs of the most famous Koyna (कोयना) dam. Its actually a Tiger reserve (कोयना व्याघ्र प्रकल्प) but the Wild Boar (रान डुक्कर), Indian Bison (गवा) are a commonly found wild animals here. 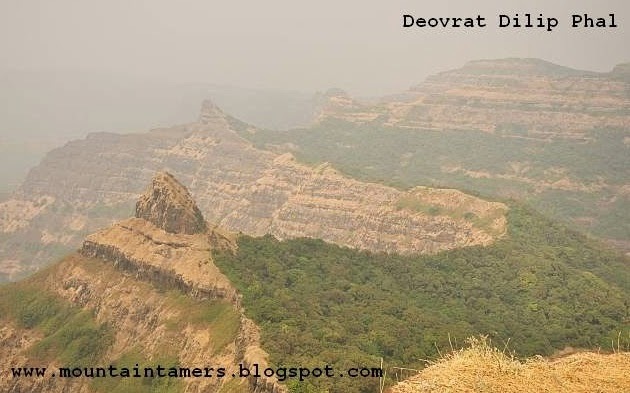 We first climbed Nageshwar, visited Vasota fort, then camped at a God-forsaken place the second day, deep inside forest, then made an unsuccessful attempt to reach a village on other side, then headed back on the fourth day. Till then, enjoy a few pics and videos ! !